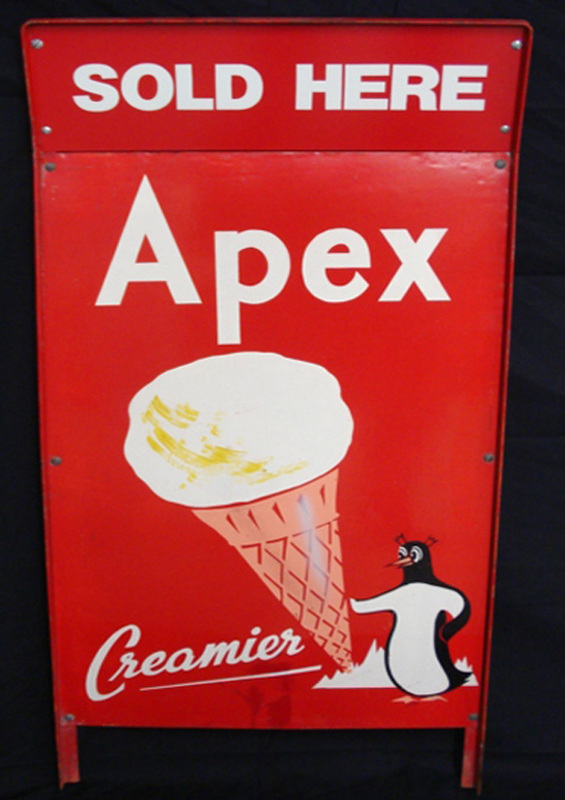 A recreation I’ve made of a rare metal and wood sandwich board, designed to advertise Apex outside on the footpath in front of a dairy. Painted tin Apex advertising. The logo and slogan were fairly standard although the dimensions varied. Above and below: The first Apex building built 1933 by Patton, at number 25 Manchester Street, on the corner of Dundas. 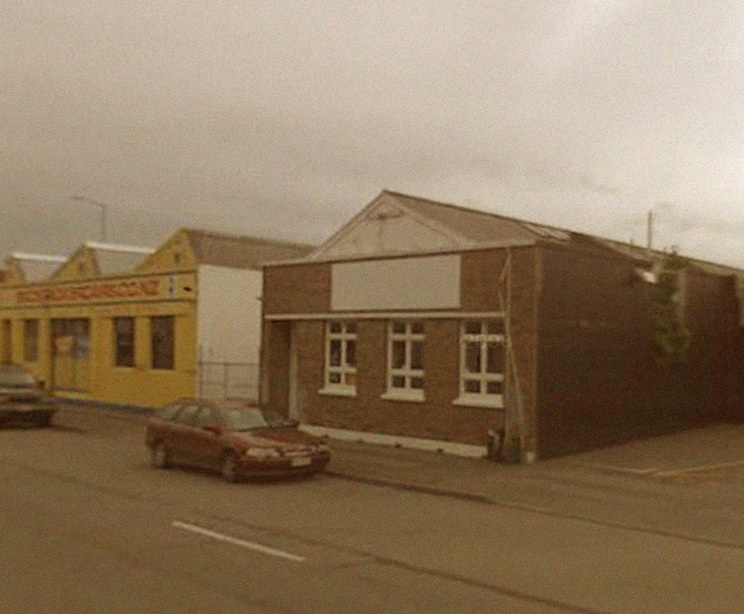 Above: The old G. E. Pattons showrooms, 188 Barbadoes Street, Christchurch, today. 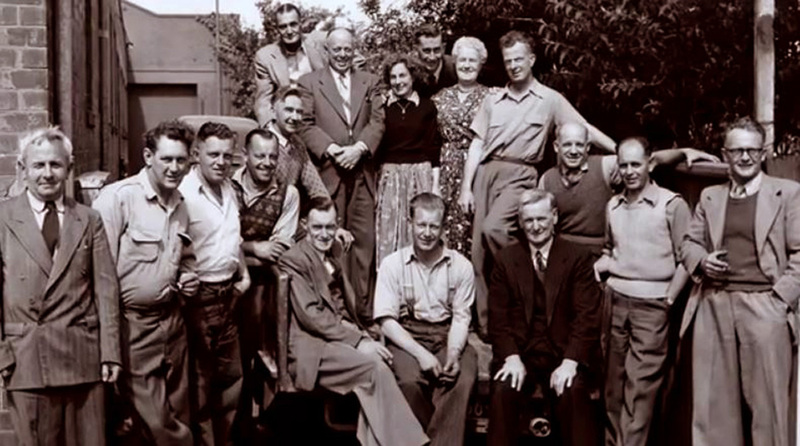 Below, the Pattons staff in the 1950s, courtesy of the Pattons website. 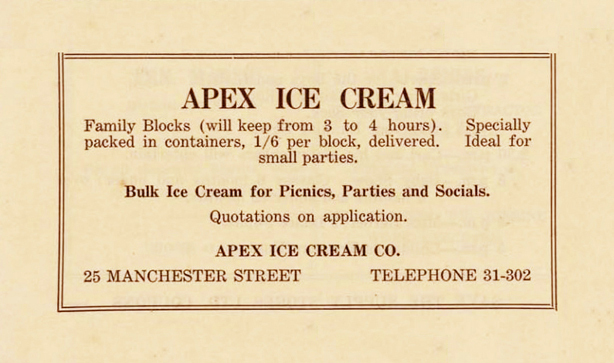 An advert for an incentive to buy Apex ice cream, Ellesmere Guardian, October 1937. Presumably a larger picture was made from individual stamps that were collected (probably not an image of an actual radio, but a picture of a radio star or show) and then once fully assembled you got your money. I doubt I’ll ever see one of these turn up – and if it did – the set wouldn’t be complete anyway. 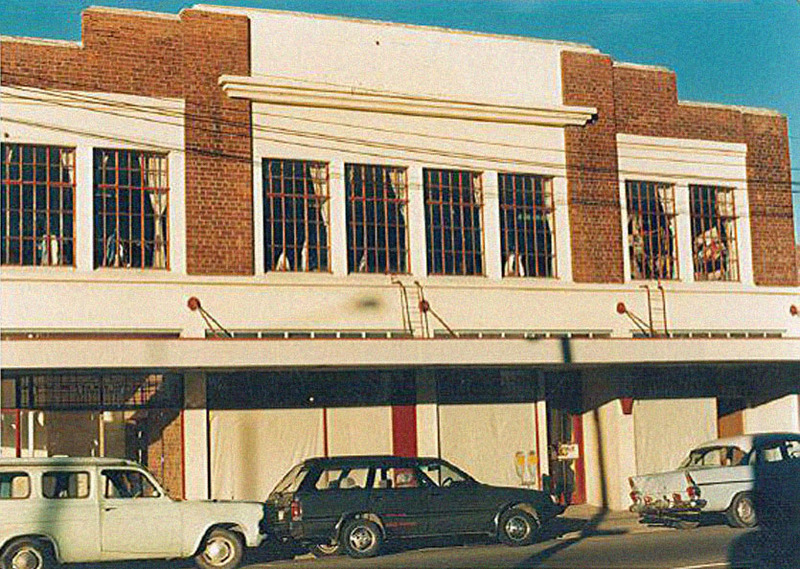 The second Apex building built 1940 by Van Dongen, Number 26 Manchester Street, directly opposite the 1933 premises on the intersection of Dundas. This became the first of a chain of 25 Lone Star Cafes. Image courtesy of their Facebook page, and appears to have been taken in the early-mid 1980s. Previous occupants at 25 Manchester street, in whatever building had been there before – were both tailors (I am sure there were others). 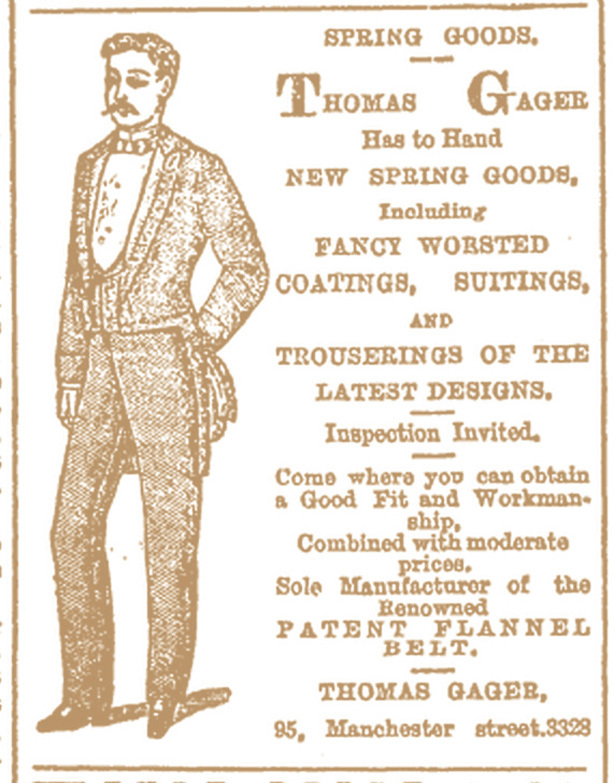 Thomas Gager is advertising an “Electric Belt” with supposed curative properties, in the late 1880s. As it turns out he fancied himself a bit of an inventor and there are a few references to his registering of patents. It seems he was in situ from at least 1882 until 1893 when there is a notice of his stock being bought for sale, after he went bankrupt – and he moved down the road to number 95. In the 1910s-1920s, Geoffrey Madden, another tailor and fitter, is calling from the same address for men with unwanted war costumes to sell for fancy dress use. 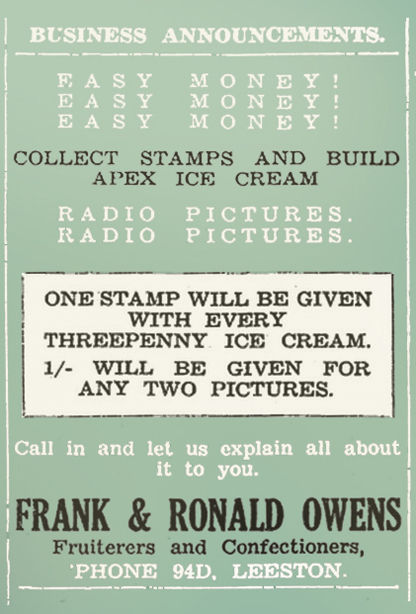 Apex advertisement from an Opawa Public Library Carnival booklet, circa 1936. 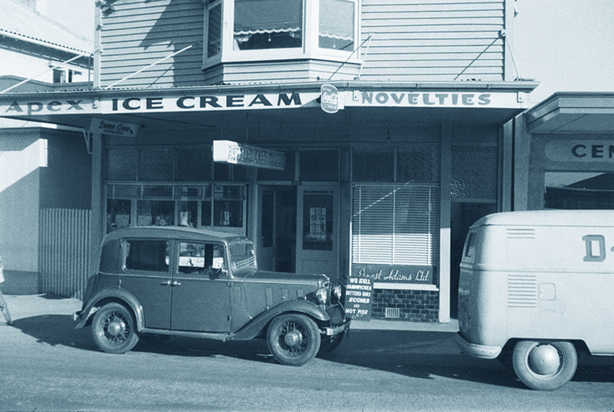 On the 29th of May, 1940, permission was again granted to Apex Ice Cream Co. to build on the corner of Dundas and Manchester Streets, Christchurch, showing the construction was done this time by a C. J. Van Dongen. Cornelius Jozepfus Van Dongen (b 1885) was presumably a Dutch immigrant given the provenance of his surname. He enlisted for service on the 5th of August 1918, and was passed as fit on the 13th. Details mention his profession as carpenter and residence in Tenysson Street, Sydenham, at the time. He was recorded as a “builder” by profession, by the time he died in Christchurch, in 1966. The only other snippets I could dig up on his background was that he married to Ethel May Van Dongen (b 1886) who passed away in 1918. They had lived for some time in Hawkes Bay during the 1910s. They had a daughter Gladys Sybil Petronella born 1907 (later married a Francis Joseph Ashworth, 1928). In 1923 he married a Sara Rubena Westwood Ritchie. Painted tin Apex advertising from outside of a building. Image courtesy of Roadside Relics, Queensland. I had a question to the retailer about how this ended up in Australia – and apparently it was purchased from the owners of a pub named Pump in Maryborough in the 1980s-1990s, who were originally from Dunedin and had it decorated with a collection of signs they had brought with them. 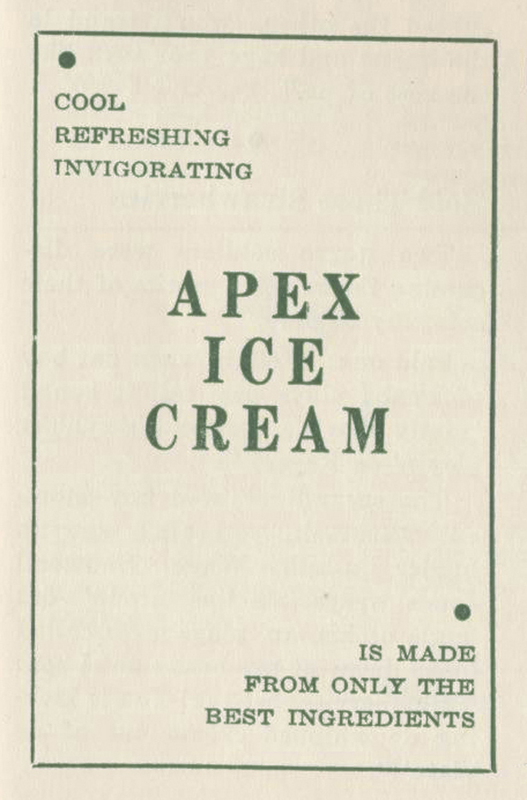 Apex advert, from Contact: The National Magazine of the Royal New Zealand Air Force,Volume 3 No 2 Jan Feb 1943, Page 65. Over the last five years three or four hand-painted tin or wood Apex signs have come up for auction – all with similar layout and slogan – although varying dimensions. The only exception has been this red dairy footpath sign (that I recreated here with some modifications) which has been for sale from a Christchurch dealer for some time now. I’ve previously contacted him through both his website and Trade Me with personal sales inquiries for items and all times I have attempted my questions have remained unanswered yet I noticed he’s very keen to provide answers when he auctions five or ten dollar items so…winning sales technique there. Ergo I haven’t even bothered to contact again and find out anything about the provenance of this item. Given that apparently he is not interested in making any serious money – he certainly won’t be answering questions when none at all is on offer. 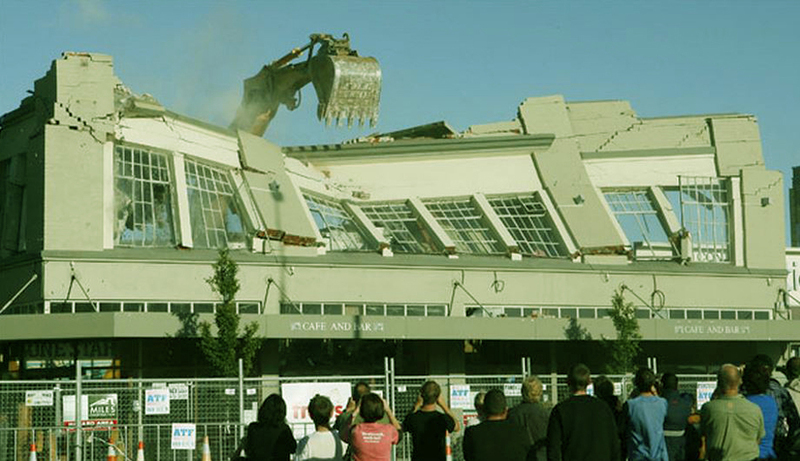 Number 26 Manchester Street, The original Lone Star Cafe, now a danger from earthquake damage, comes down. 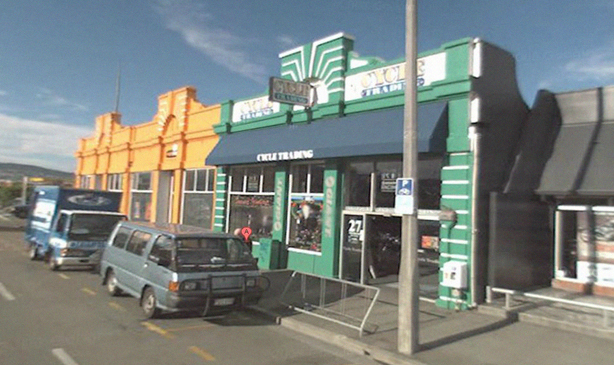 Data indicates that Apex was still running into the early 1970s at least (Christchurch Planning Tribunal/Environment Court case files are on record for 1971) – but it was eventually bought out by Tip-Top along with other companies like Supreme, New Joy, Robinson, Perfection, Eldora, Sunshine, Peter Pan, Alpine, and Wall’s. By 1964, Tip-Top had finally achieved national distribution by gobbling up all the smaller (frozen) fish. 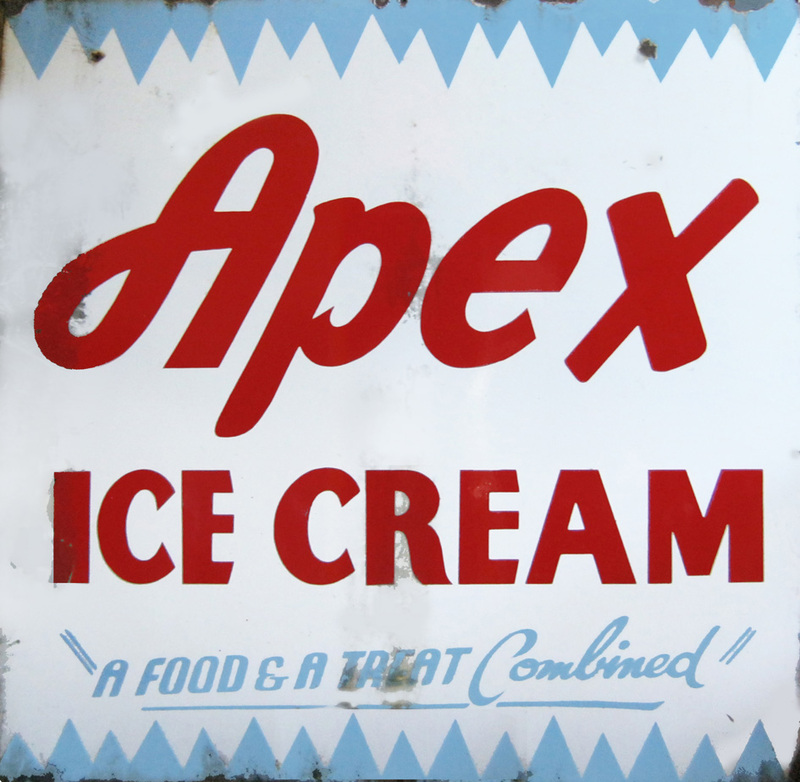 Closed company files indicate Apex may have changed hands in 1956, then again in 1964, which may be when Tip-Top stepped in and took over – since they were on a roll at the time buying out smaller brands in their bid to get to the top – they bought out Eldora in 1964 and Supreme in 1963. The final Closed Company Files for Apex were lodged sometime between 1964 and 1979. The only employee I’ve tracked down also commenced working for Apex in 1960 and finished up in 1964, so all the dates converge to some telling event. Unfortunately I was not able to talk to the person in question before publishing this article – but I am sure there is more to be added to this story in future. Perhaps someone trawling the web will come across this and be able to pass on some vital information that fills the gaps, like they did with the Peter Pan Frozen Foods saga. Above: Gager, had been just one resident business owner in the days before Apex. From the Star, Page 2, 29 December 1896. He moved to 95 in 1893, but he was already hawking his own patented invention of electric accessories from his former address at 25 Manchester Street in the 1880s. 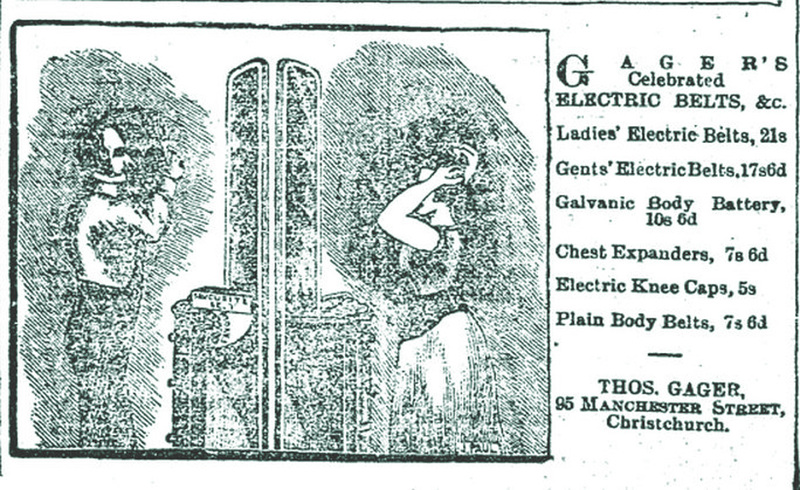 Below, an ad from the Press, 15 November 1893, Page 7. Credits: Thanks to Dave Homewood, from Wings Over Cambridge, check out their collection of great Contact magazine covers online here. Also thanks to Chris Newey from Foodworks online – the New Zealand Food & Beverage Directory, for some research pointers. 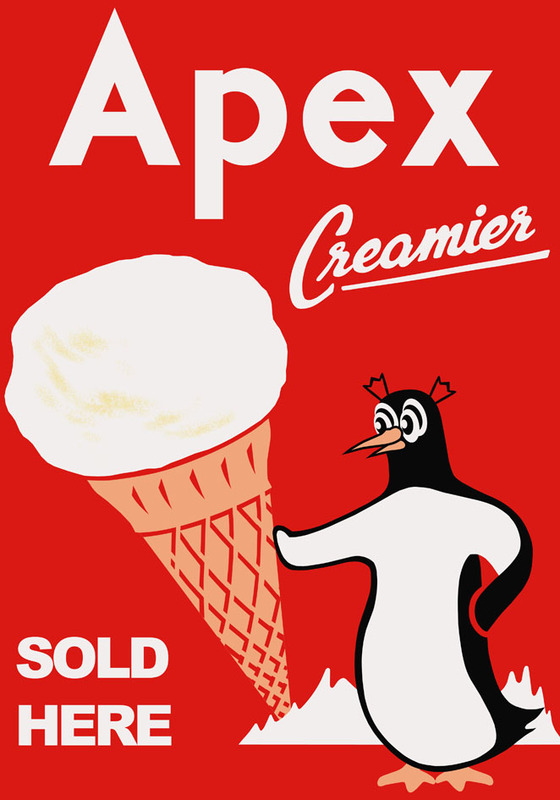 Addendum mid-Jan 2014: I’ve added this amazing, extremely rare image of an early piece of Apex advertising. 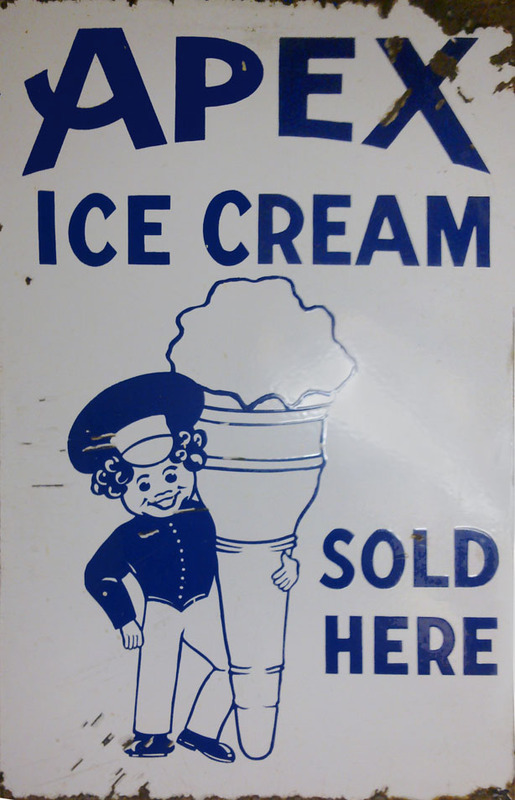 This was sent to me by Nick Boblea, a hard-core veteran of enamel sign collecting. He has an amazing accumulation from what I’ve seen – and was kind enough to contact me after reading this article and offer a picture of this one. I’m guessing it dates from the earliest days of the brand. 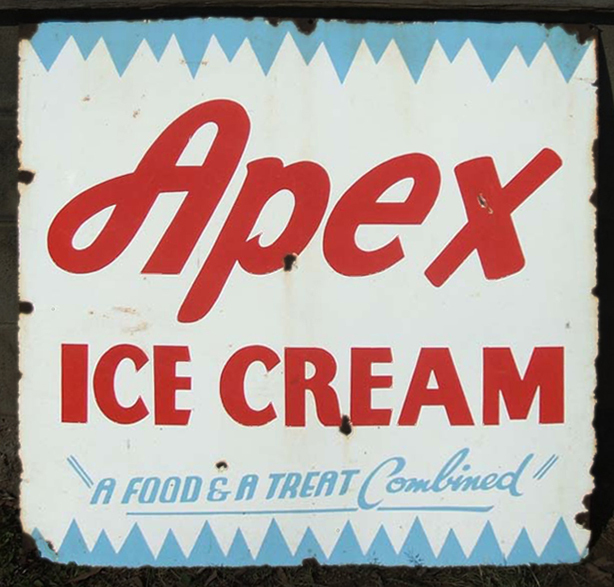 Addendum mid-March 2014: Reader Carolyn Catt kindly sent in this image of one of two Apex signs stashed in her garage, that she acquired twenty years ago in the Christchurch area. Well researched as always. I love that advertisment from Leeston! Good finds! Thanks Lemuel. Truly, I did a lot with a very little…it’s economy history! There’s no way to attach images to comments, but I will get in touch with you. Thanks for reading! Hi Leslie, thanks for your comment, I have emailed you. The building at 26 Manchester Street was also, in the late sixties, occupied by TeeVee Radio on the ground floor and in 1969 a rock group called Blues Army Salvation and I opened Sweethearts Club on the top floor until a fire shut us down. Thanks for this information John. I need to revisit this post as I am not sure how accurate my story is at this point. 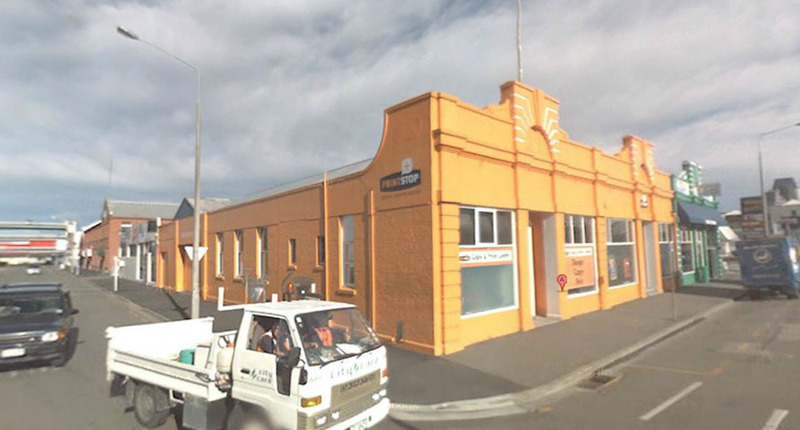 Recently my friend Dr. Dave aka David Murray from the Hocken, who writes ‘Built In Dunedin’ blog, covered Apex and now I’ve read that I am not sure how accurate my info on the second building is, and in fact may not have even have been theirs at all.